You are here:Home » Category: "Food"
In the Torah, the Land of Israel is described by God to be a land “flowing with milk and honey” (Exodus 3:8). Once you taste the fruit in the Holy Land, you will understand that this biblical reference remains true, even in modern times. 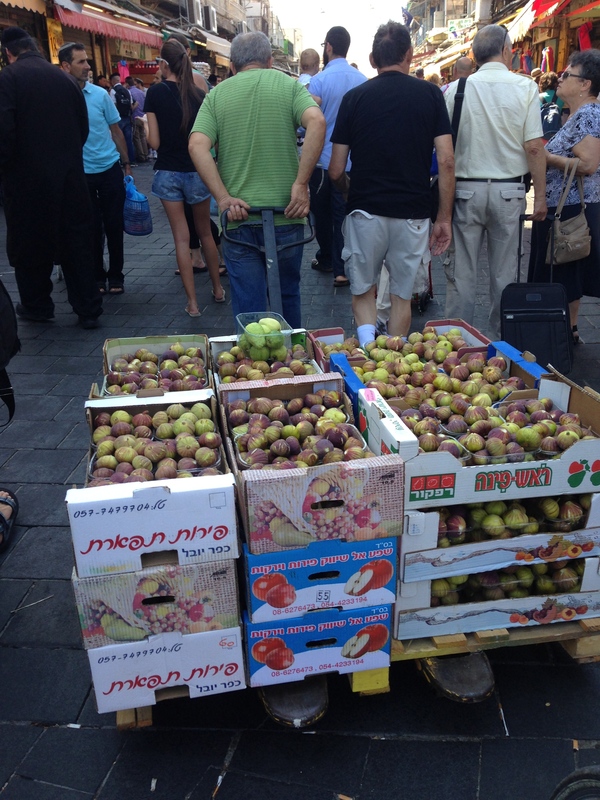 As mentioned in a previous post about ice cream and sorbet, the produce in the Holy Land is f-r-e-s-h. There is always a fruit in season that the whole country raves about. A few weeks ago the talk was about figs. 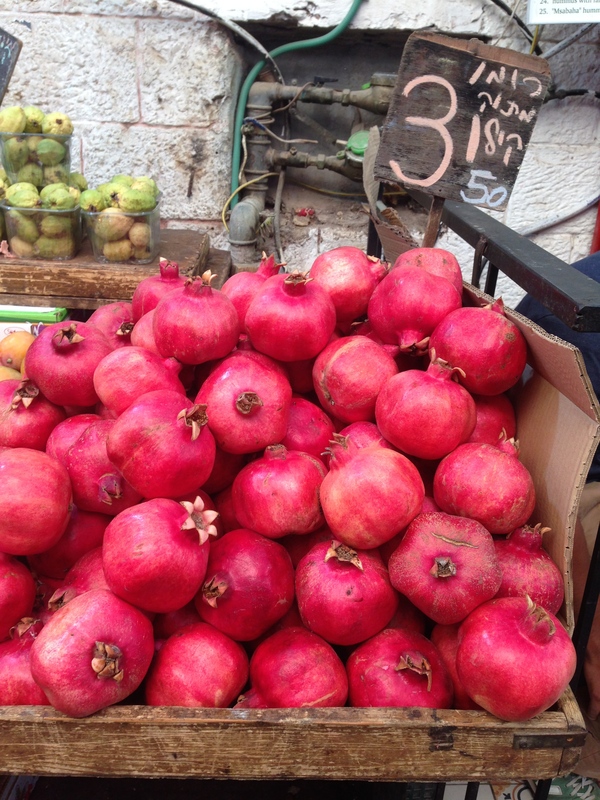 For the next few weeks, pomegranates will be hot on the market. Both figs and pomegranates are considered to be part of the Seven Species. According to Judaism, these fruits are special and during the times of the Temple, they were brought to the Temple as an offering to God. Today, because there is no Temple, Jews say a special prayer before eating one of the seven species. The other five other species are wheat, barley, grapevines, olives, and date honey (which is believed to be the honey in the biblical reference mentioned above). According to Christianity, the fig symbolizes the search for truth. A way to search for truth is by producing fruit. It is said that if a Christian does not produce fruit in a certain period of time, his life is cut off from God because God does not profit from unproductive Christians. When the New Testament talks about this, it specifically references fig trees. Perhaps it refers to fig trees because it is a sterile fruit, meaning it requires seasonal labor. Fun fact: It is believed that edible figs are one of the first plants cultivated by humans back in 9400–9200 BCE. More fun (because “funner” isn’t a word) fact: It is also believed that these figs were cultivated in the Holy Land’s Jordan Valley. It is also written in the Torah that Adam and Eve “sewed fig leaves together and made themselves loincloths” (Genesis 3:7) once they discovered they were naked. They discovered their nakedness after they ate from the tree of knowledge of good and evil. Some Jewish scholars believe that it was a pomegranate Adam and Eve ate. 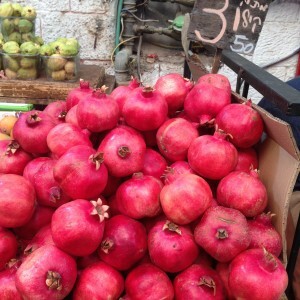 Additionally, is believed that pomegranates contain 613 seeds, which correlates with the 613 commandments. In Christianity, opening pomegranates symbolizes the fullness of Jesus’ suffering and resurrection. Pomegranates are used for religions decoration in both Christianity and Judaism. 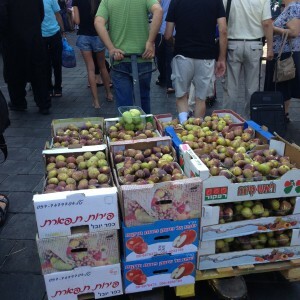 Which fruit season do you want to be in when you come on a Holy Land tour? Every holiday has its star food. Whether its Easter with chocolate eggs, or potato latkes and donuts during Hanukah, or Ramadan’s delicious Qatayef pastry, there is always a special food that is synonymous with a holiday. And honey claims lead billing during the Jewish high holidays. A bowl of honey is a traditional ‘dip’ eaten throughout the Jewish holiday period – eaten in hope of a sweet new year. Dipping apples in the honey reminds us just how sweet life can and hopefully will be in the coming year. Abbie Rosner, author of “Breaking Bread in the Galilee, cites Nogah Reuveni, one of the pioneering scholars of the Holy Land’s biblical landscape, who observed that of all the seven species, one is not a plant or plant product. Most of us might think of honey as coming from a beehive, but actually, it can refer to any sweet syrup made from boiled-down fruit. Reuveni thought that honey made from dates, known as Silan, was the seventh specimen which would make it consistent with the other products on the list. Silan is a popular authentic type of syrup that is quite similar to honey, and considered the authentic sweet Holy Land syrup. With the late summer harvest now in full swing (one can easily enjoy a day out picking apples, pomegranates, peaches, grapes and more), tasting honey is also a late summer ritual in this biblical landscape. The Israel Honey Board is now holding its annual Honey Festival (August 22 through September 27) and if you are on a tour to Israel or the Palestinian Territories you can easily participate in the many kid-friendly activities that are underway throughout the region. Honey manufacturing visitor centers focusing are offering a variety of fascinating activities focusing on the world of bees and honey, meeting with beekeepers, honey tastings, and learning about the importance of bees pollinating flowers in order to make fruit and vegetable plant food. Bees are critically important to the world, not only for the honey they product but because of their participation in pollination. Below you’ll find a listing of several honey making visitor centers offering festival-related activities and tastings. Call before you go to find out the hours of operation and the exact times and costs for any special activities that are going on during the festival. Within this visitor center you can watch the activities of the bees and the queen bee through the glass. Visitors learn about the health qualities and enjoy tasting the finest products directly from the source. A nice film on the life of bees and how all the hive products are produced including honey, beeswax, propolis, pollen (pollen), and bee venom production process. In addition to the apiary the center also produces olives. Venus Reuben beekeeping since 1984 celebrates 30 years of service. Today, 650 Honey Reuben and another 300 hives and queens increase the powder, making the Galilee Flowers Beehive particularly large breeding farm. 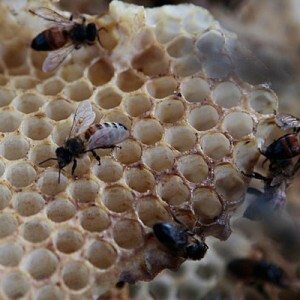 There is a visitor center which tells varied activities on the world of bees, honey and more. Beehives tour includes the movie “Sweet Honey Queen to” explain the world of bees, self harvesting experience, viewing glass hive bee activity, “beehive kids’ craft corner with corner with wax sculptures, costumes, reading and research. “The Time Tunnel” – represents a unique way to teach kids about bees and honey since then includes the stories of the Bible. Founded by Jamal price Peqi’in village in 1977. Hir invites families and children enjoy a unique combination of rural tourism in nature Druze variety of educational activities and knowledge of the world of the bee. Visitors will learn about the process of honey production, the sundials and the history of the village Peqi’in Druze community. Beehives, Workshop candles by rolling slabs crude beeswax special thread, decorative candles with colored sequins and pins. In addition, basket weaving can join to fill bottles with colored sand, petting zoo and spend petting zoo, camel riding, BBQ picnic benches and more. Machmanim was established in 1980 as a small apiary Galilee. Beehives and bees are handled carefully, allowing them to collect high-quality honey which come from within the flower nectar found in nature. You can come and visit the beehives and hear the ‘Natural Therapy’ healing products bees, pollen, propolis, bee venom therapy, honeycomb, and more and enjoy activities such as creating beeswax candles decorated and other workshops. Tour “Through the Bible to nature”, a biblical village eco tour that combines visiting beehives, activities and preparation respecting nature: whole wheat bread, natural honey preparation of milk, tahini and sesame, white, hyssop herb tea. 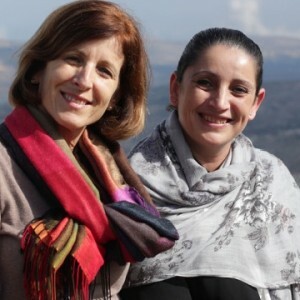 Visitors tour the observatory Michmanim, Khan stone, magnificent views, tour and tasting beds perfume ancient cuisine flavors. Renowned Beekeeper Boaz participated in the 2014 in the international competition in Canada earning third place in the world. During “Honey Festival”, visitors are invited to watch a movie about the competition, children will enjoy being made up as a bee and other including a tour of the site. guidance on how to prepare honey and the learning about the importance of nature. Bees visit the observatory and increase patrol in silk cocoons thousands (only in Israel). Children enjoy a variety of creative activities such as preparing a chocolate honey, candle wax, plaster decoration, sign and cape bee room, living area with the option of hand-feeding pygmy goats and a giant bee going around among the guests. Honey Festival will be possible during the trip by tractor and wagon (extra charge). The visit to this center in the northern Galilee includes a movie on the world of bees. Watch the bees inside the beehive glass, how they make the honey, meet the beekeeper and learn about the various products of the hive. Preparation of candle wax, tastings and more. Who want to be able to tour the winery and taste the next Yiftachel wines. View a short film for the whole family to our wonderful world of bees, the structure of the hive, collecting nectar to make honey and the importance health person, workshops for children on the subject of bees, honey and blossom, and a lecture accompanied by slides for adults, meeting area with a beekeeper apiary Emek Hefer to open a hive and demonstrate his work. Factory store tasting of a selection of honeys, pollen (pollen), royal jelly and more. A tour of the factory and packaging production lines is also available. Lin’s Farm is a family farm that has been more than thirty years the bees are part of the family. Dedication in taking care of bees and honey production respondents Love-natural, pure, delicious and nutritious. 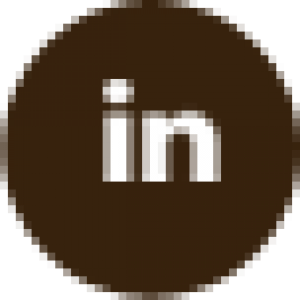 To foster economic approximately 1000 hives around the country, where the economy shop with a natural delicacies produced in Lynn bees and honey are based on quality raw materials. Visitors learn about the similarities and differences between the bee family man, dressed in work clothes with the help of bee keepers and games, creative activities, watch video and learn about glass hive field work, the communication between the bees, the queen, active and males. 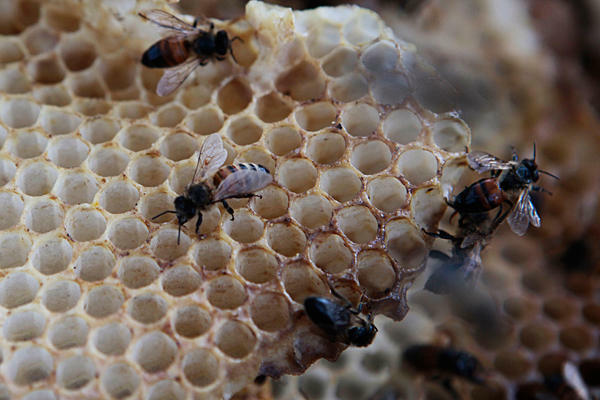 Yad Mordechai Apiary was established in 1936 and is now the largest apiary in Israel, numbering about 5,000 hives. Visit Honey and Bee House “is a showcase for the world of bees, hive and the routine work of beekeepers. Visit suitable for all the family and includes: Opening honeycomb behind a glass wall, meeting with beekeepers demonstrate their work, display a hive of glass illustrates everything that was happening in the hives, watching a movie depicting the honey production and operation of honey harvesting, baking honey cakes, tasting different kinds of honey, creating candles beeswax, explanations of the bees in the hive family structure, living in it, explanations of health products that are produced from the hive, royal jelly, propolis, pollen, and more. Instead shop for Honeycomb. The activities are part of an integrated card activity tourist resorts Yad Mordechai (driving a tractor and wagon, “a grouping of time” type recovery tank battle site and watching the milking barn). When love bees and desert growing art she met a charming attraction Prairie “art and agriculture meet in the desert” – a world of bees, colony formation presentation in memory of holidays Porat, founder session and meeting with artwork of Chacha Porat, including the works of bronze, iron and wood. Apiary Porath introduces the visitors to the wonderful world of the honey bee, and the most important animal in the most fascinating lives today, a creative and unusual way. Museum space, in the light of special lighting and desert never displayed apiary bee close-ups ever, thousands of bees flying metal museum space, hives containing bees transparent low-down busy work diary. In addition, there is a movie about a world of bees and shop to buy honey, olive oil and wine. In addition, there is a possibility the meeting and dinner in the dining room of the old eye and view the presentation about the establishment. No Holy land travel experience is complete without tasting your way through the myriad of cultures present all over this land. 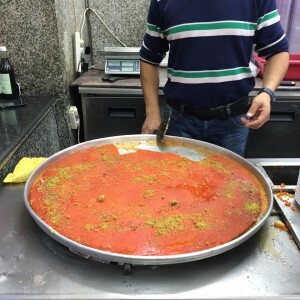 And while ice cream and sorbet may not be traditionally Israeli or Palestinian dishes, they are still quite popular in the Holy Land, particularly during the hot summer months. 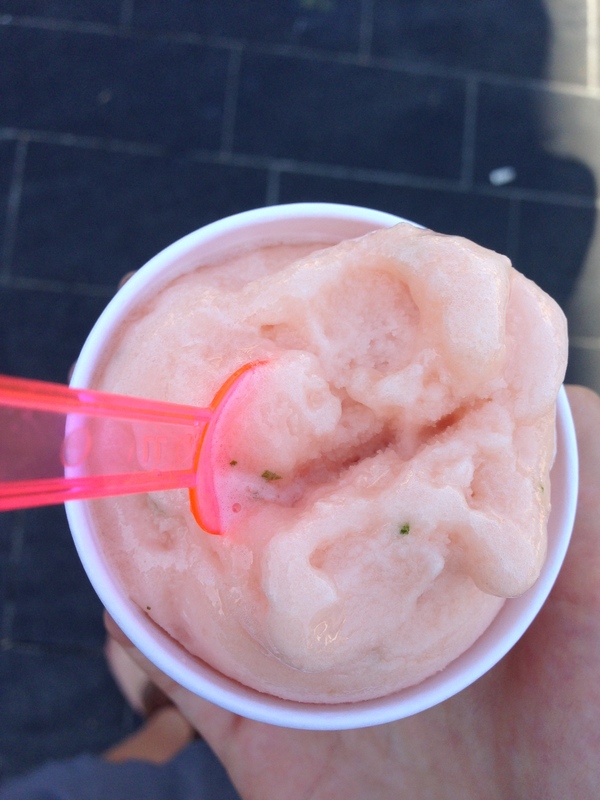 The sorbet and ice cream here are fresh and rich in taste and are worth eating…often. So, to all the ice cream and sorbet lovers wondering what the Holy Land offers in this all important food category, this post is for you. I recently happened upon an unusual ice cream store where I was introduced to a world of new frozen flavors, many of which were inspired by the many cultures present in this region. 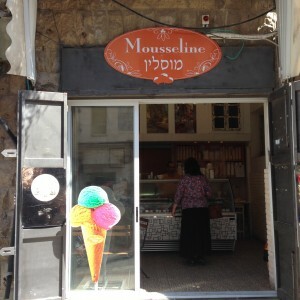 Unlike other ice cream stores, you won’t find typical chocolate, vanilla, or coffee at Mousseline. Rather, flavors like wasabi, berry cheesecake, basil, and olive oil and interesting Middle eastern inspired sorbet flavors such as grapefruit-basil, sour cherry, lemon-mint, and almond are a few of the unique tastes offered. 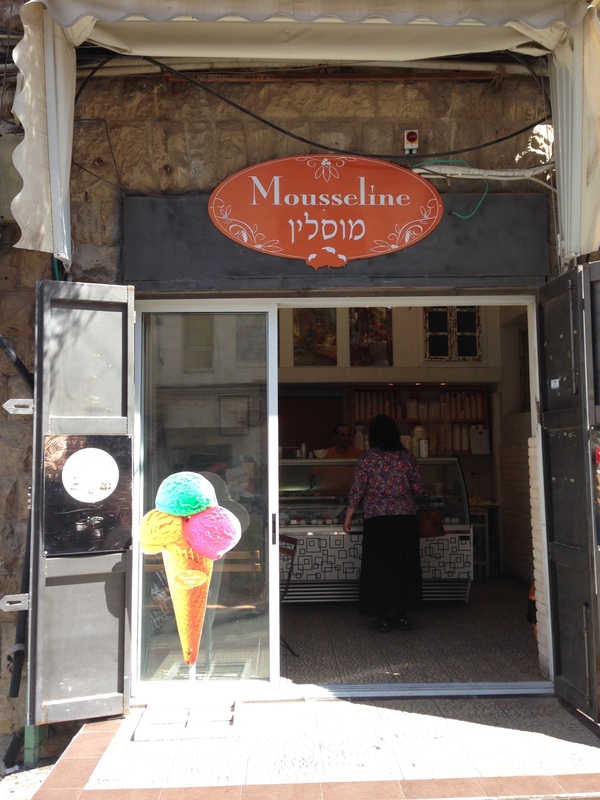 Mousseline is located in Jerusalem’s Machane Yehuda (also known as the Jewish shuk) situated in the west side of Jerusalem. The store prepares its ice cream using the freshest ingredients from within Machane Yehuda market, producing a regular supply of incredibly fresh and tasty frozen flavors. 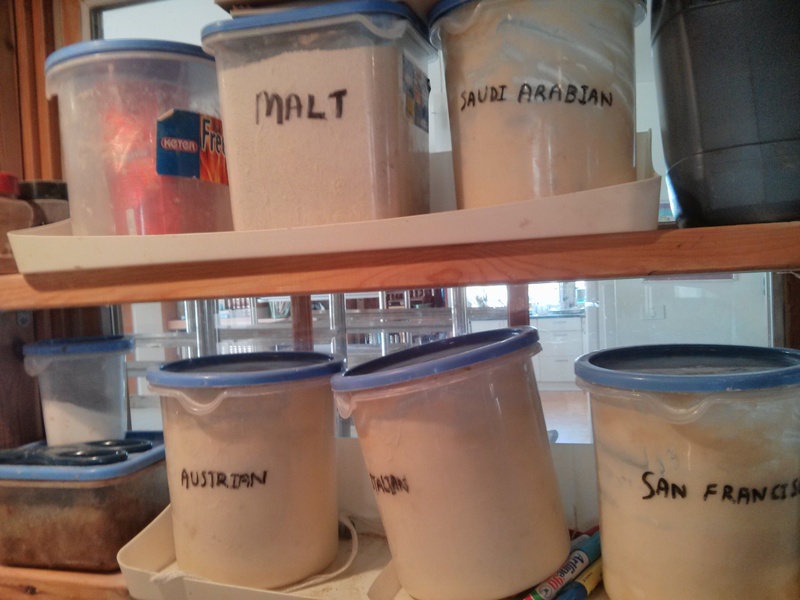 During my first visit to Mousseline, I was intimidated by all the unusual flavors. I did not even know which one to try first! Luckily, the friendly staff allowed me to sample as many as I wanted and even suggested which ones to try. The phrase I repeatedly used was,“ef-shar li-tome? meaning “may I taste?” No need to worry, though, the staff speaks fluent English (and perhaps even other languages). 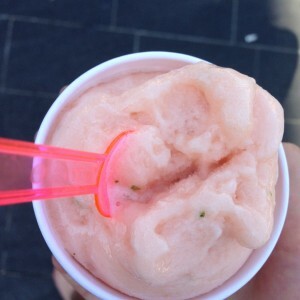 With pressure mounting after several samples, I ultimately decided on the grapefruit-basil sorbet. Two thumbs up! An Israel cultural tour will most likely include a visit to the Machene Yehuda shuk. Make sure you take the time to walk around and not only see the different stands selling colorful fruit, vegetables, nuts, candy, pastries and more but taste your way through as well. To know a people is to know their food. Which flavors would you like to taste? 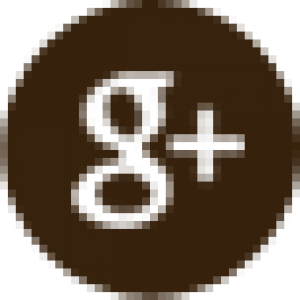 For more information about the store and its location, click HERE. For the store’s website (in Hebrew), click HERE. The 12 square meter kitchen might be cramped but there is nothing small about the taste of the artisenal breads created by Les Saidel in his tiny workspace in Karnei Shomron. Meet Les Saidel, a South African immigrant who learned the art of baking from his mother at the age of 13. However, he wasn’t to find his true calling as a specialty bread baker until his mid 40’s, after he lost his job in the high tech industry when his employer went bankrupt. 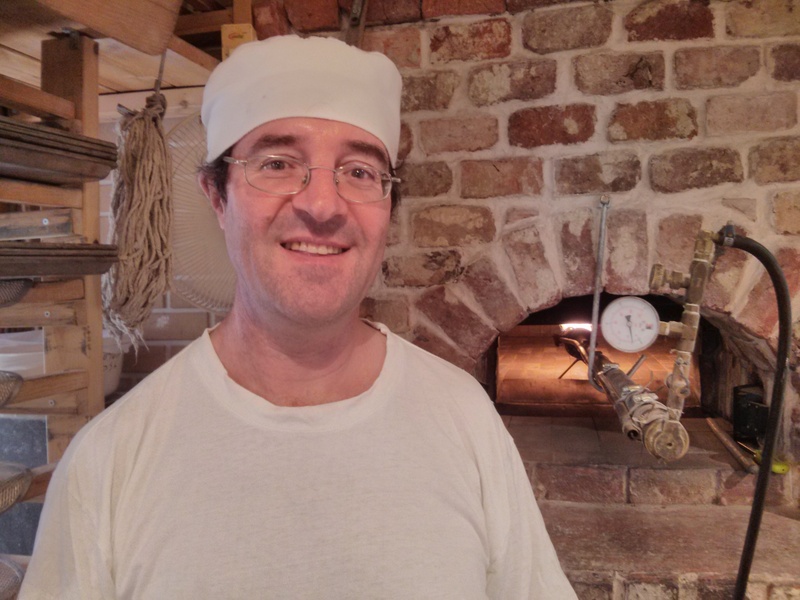 Left with no job and no real means of employment in high tech (four mouths to feed including one special needs child) – Les opted to go back to his roots – and become a professional baker. 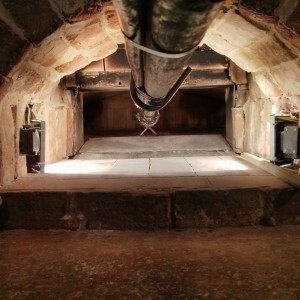 He received a break baking degree from San Francisco Baking Institute and rather than purchasing a 40,000 Euros commercial oven which he could not afford, he spent $650 and purchased professional blueprints from Alan Scott, a professional brick oven designer based in Tanzania. 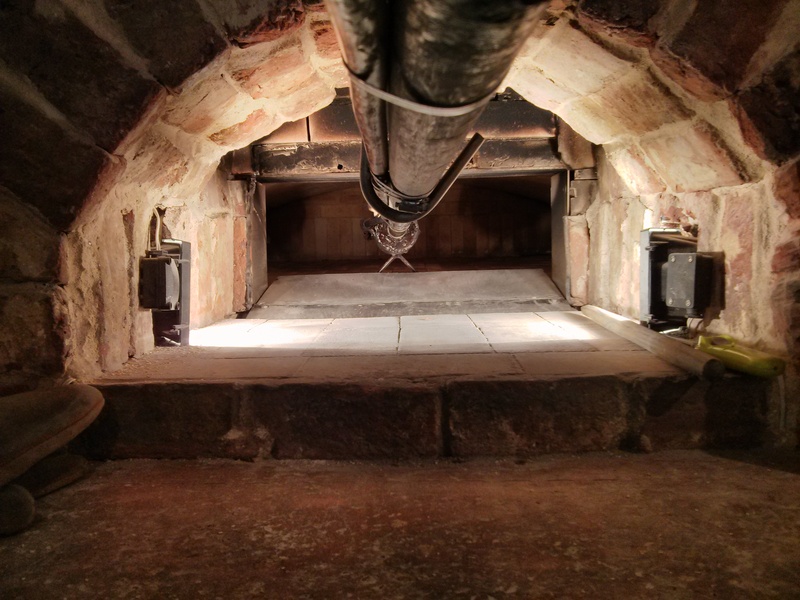 Alan coached him through the entire building process – it took two months for Les to build his world class oven, that contains over six square meters of baking space. Then he had to find the right starters. 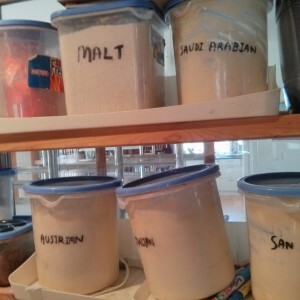 Through Ed Wood, a chemical engineer based in Saudi Arabia, he purchased sourdough starters from Austria, Saudia Arabia, San Francisco and other places. 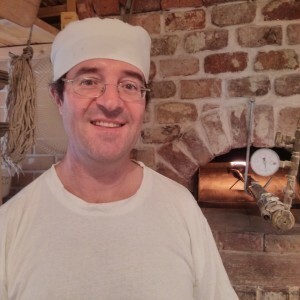 With great care Les feeds the starters daily and continues to grow his own cultures for his bread making. The bakery is too small by local health standards to be licensed as an official bakery so Les runs professional bread making workshops for small groups out of his home and kitchen in the heart of the community of Karnei Shomron, a small settlement community 30 minutes from Tel Aviv. During his workshop, Les explains that he didn’t move to the community for political statement at all but rather because he was seeking a rural atmosphere, good schools, warm community and access to the big city. Interesting story which Les is happily speaks about during his engaging workshop. They use to live in Beit Meir outside of Jerusalem, but wanted a more pastoral setting and quality of life. There is a simple rule that goes when you are speaking to Israelis-1. Israelis think they are always right. 2. If they are wrong, refer to rule number one. These two golden rules are a given in Israeli society and its normal to hear two men arguing over whose mother makes a recipe better, even if the recipe originates from a few different places. So the next few blog posts are going to focus on the origins of various Israeli and Palestinian recipe and their origin(s). Try ‘em out and let me know what you think! Shakshuka is a staple of the average Israeli diet, eaten either for breakfast or dinner. It consists of a tomato vegetable mixture and a sort of sunny side up on top of the mixture. Oftentimes shakshuka is served with bread as it’s a great dish to dunk a warm slice of bread in. There are two keys to this dish- the tomato mixture recipe and how the eggs are cooked (rare or well done). In my family the tomato mixture is the deciding factor on whose shakshuka tastes better. I prefer a more mild mixture whereas my brother likes to add schug (a spicy Yemenite mix of fresh hot green peppers ) to his shakshuka. 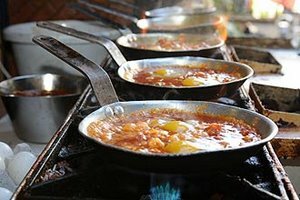 The origins of the shakshuka dish are said to have founded in North Africa- Tunisia, Lybia, Morocco, and Algeria. The recipe was then brought to Israel by new immigrants. But others say that it was founded in the Ottoman Empire and the dish spread throughout the lands. There are many different additions to this dish, depending on which country you are in. Some add sausages, others lamb, but in Israel the dish tends to be vegetarian, with additions of Bulgarian cheese, Mozzerella, swiss chard, eggplant or spinach. Those who are vegan can skip the egg part and stick to the sauce. 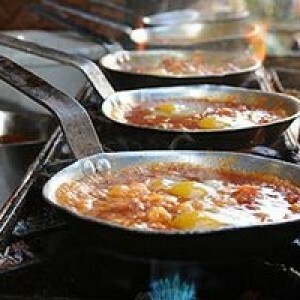 One of the most famous places to eat Shakshuka is at Dr. Shakshuka in Jaffa which opened its doors some 20 years ago. The restaurant which specializes in homecooked Tripolitan cuisine is run by Bino from Tripoli and for the last 20 has been an institution. 4/5 eggs- depending on how large your pan is! Chop onions and sauté until golden on flame, add tomatoes- let simmer until soft. Add green pepper, and minced garlic. Sprinkle sugar in mixture. Add spices to taste. When mixture is ready, crack the eggs in different areas of the pan and cook to taste. Sprinkle Cheese on top! 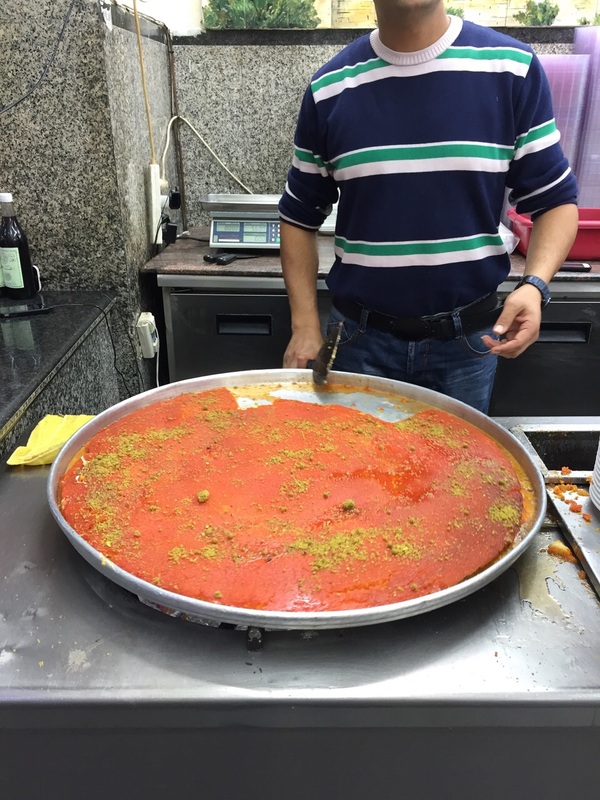 And, as they say in Israel, “Bitay Avon” – (aka bon appetit)! An Israeli-Arab microbiologist and mother of three won the fourth season of Israel’s most popular reality TV show, “MasterChef.” Her winning dish – Sultan’s Spring. Nof Atamna-Ismaeel, 32, is a mother of three and possesses a PhD in microbiology. She is the Israeli-Arab town of Baqa al-Gharbiyye, north of Netanya. While she plans to use her prize money to open an Arab-Jewish cooking school she ultimately would like to use her food to create common ground between Arab and Jewish Israelis and very much believes in the power of food to foster deep bonds between people. Soak the bread in water for about two minutes. Place almonds and garlic in a food processor and grind. Squeeze out the bread and add to the processor bowl. Gradually add olive oil and lemon juice and process, then add the lemon zest, salt, pepper and seasonings, and set aside. Cut the fennel bulb and green almonds into thin slices. Add the leaves of wild fennel, hot green pepper and thinly sliced and chopped pickled grape leaves. Season with olive oil, lemon juice and salt. Clean the fish and debone, then salt with coarse salt. Season the inside of the fish with a little grated lemon zest and salt. Flour the fish and pan-fry in plenty of oil. To serve, spread the almond cream on a plate (like hummus). Top with the fennel salad, almonds and green chickpeas. Place the fish over the salad and top with chopped tomato. Drizzle with olive oil and lemon zest and serve.